The Caulfield Properties Team at Compass has taken over sales for Beacon Hill’s hottest new condo project, The Archer. This exclusive, boutique development will convert two historic buildings into 62 luxurious condo homes. A new construction penthouse level will top off the project. Spacious homes range in size from one to four bedrooms, all blending historic character with elegant finishes and modern amenities. This full-service building offers a highly-curated suite of amenities including a Club Room, fitness and wellness rooms, children's playroom, and underground garage parking. Residents can also enjoy amazing views of Beacon Hill from the nearly 5,000 square foot roof terrace. Nestled on Temple Place in Beacon Hill, The Archer offers residents the charm of this historic neighborhood with many of Boston’s other great neighborhoods just a quick jaunt away. For more information on The Archer contact the Caulfield Properties Tema at 617-501- 3685 or visit https://thearcherresidences.com/. Just a few blocks from M Street Beach and Castle Island, in South Boston’s East Side, the new homes at Leonard Place are nestled in a quiet neighborhood setting, while offering easy access to South Boston’s bustling social scene. These brand new units feature top of the line finishes, high ceilings, private outdoor space, and garage parking. The kitchens at One Leonard feature two-toned custom cabinetry and stainless steel SUB-ZERO and Wolf appliances. The mix of colors and textures within the kitchen provide a unique, modern, yet neutral backdrop open to the living areas, perfect for entertaining. The 2 bedroom homes offer a master bedroom suite and guest bedroom with large closets throughout and 2 full bathrooms, featuring contemporary, luxurious finishes. The penthouse unit, listed for just under $1 million, also includes a private roof deck with water views. 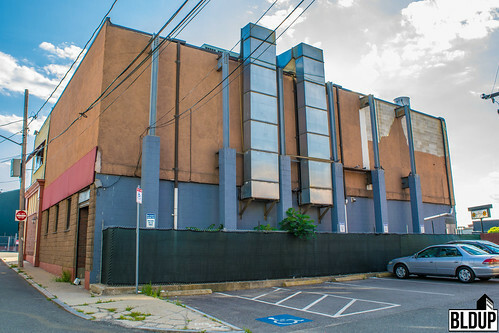 Only two units remain available in this six-unit building. For more information about Leonard Place, visit https://www.caulfieldproperties.com/ or call The Caulfield Properties Team directly at 617-501-3685. With a range of high-end condominiums in Boston Proper, discerning buyers will look to the finishes of a home when making a multi-million dollar decision. At 80 Commonwealth Avenue, every attention to detail has been paid, most notably in the 4 bedroom penthouse, triplex home. The historic brownstone, originally built in 1872 has been lovingly restored with both classic and modern touches, while added features and amenities provide ease and convenience for residents. Throughout the 3500+ square feet of living space in the penthouse, you’ll find Herringbone White Oak tongue-and-groove hardwood flooring, custom moldings, baseboards, and built-in cabinetry, and 3 separate wet bars. These features combined help maintain the historic charm of this landmark address and allow for an elegant look throughout the living spaces. The custom, Christopher Peacock kitchen features the designer’s beautiful hand-crafted classic British cabinetry topped with natural stone countertops. The Wolf gas range includes six burners along with an infrared griddle and a spacious gas convection oven coupled with a smaller non-convection option. This really is a chef’s dream kitchen. To modernize the space the developers have also added custom closets throughout including an enormous walkthrough in the master bedroom. The bathrooms too have been completed with great care. The three full baths, and two halves in this home feature custom vanities and natural stone floors and walls. The final details of this home that make it so very special are a private elevator and rooftop terrace. Located just 1 block from the Boston Public Garden, The Residences at 80 Commonwealth Avenue overlook the Commonwealth Mall and offer easy access to the amazing shops and restaurants of Newbury Street and The Back Bay. For more information on this custom home please visit https://80commave.com/ or contact The Caulfield Properties Team at 617-501-3685. 14 West features 49 luxurious condo homes at the intersection of South End, South Boston, and The Seaport. This full-service building offers elite concierge service and a full suite of hotel amenities including room service and valet parking. The state of the art fitness center includes Peloton bikes, Life Fitness, and Hammer Strength equipment. Topped by a roof deck with stunning Boston Views, 14 West is truly a unique offering in one of Boston’s fastest-growing neighborhoods. 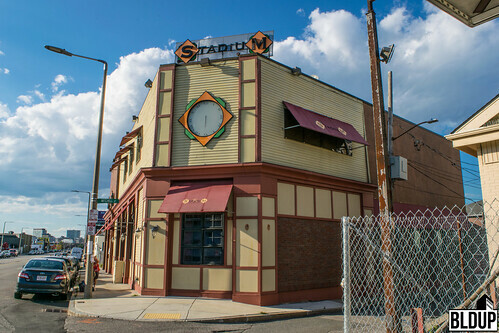 The building is conveniently located directly across the street from the Broadway Red Line T stop. On the interior, units range in size from an 830 square feet one bedroom up to a 1600+ square foot 4 bedroom duplex with a private balcony. All units feature designer cabinetry, quartz countertops, and integrated Sonos Sound systems, perfect for entertaining. Construction on the project is now complete. For more information on 14 West contact The Caulfield Properties Team at 617-501-3685. The luxurious marble lobby at 14 West. The spacious, open kitchens feature quartz countertops and designer cabinetry. Floor to ceiling windows bring in ample sunlight, creating a bright and airy feel. Spacious, modern bathroom with a tinted shower door for a touch of color. Enjoy these amazing views from 14 West's roof deck. 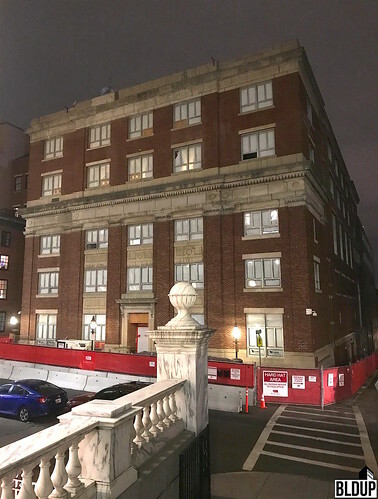 The project change calls for the redevelopment of existing Suffolk University Archer and Donahue buildings into 62 (originally 67) residential units with 54 (originally 50) parking spaces. The Archer Residences will restore two existing historic buildings and construct a new penthouse level. Amenities at The Archer Residences will include concierge service, a fitness center, a children's room, and a common roof deck. 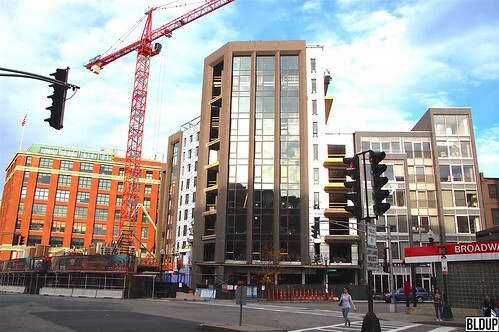 An electrical permit has been issued for The Archer Residences in Beacon Hill. The luxury condo development along Temple Street will feature 67 condo units in two restored historical buildings. Resident amenities will include concierge service, a fitness center, a children's room, and a roof terrace. 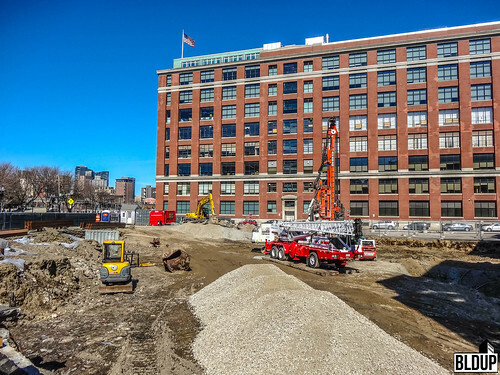 A Certificate of Occupancy has been issued for the all-new luxury condos at 14 West Broadway in South Boston. The 10-story building includes 49 condos featuring open concept layouts, large windows, top of the line appliances and marble bathrooms. The project also features a covered portico at the back of the building for residents to access 24-hour underground valet parking. 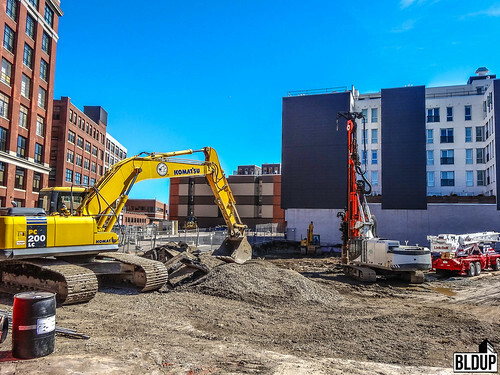 14 WEST's ground floor will include a 350-seat, 6,000 square foot restaurant that will be connected to the ground floor of 6 West Broadway, the hotel being built next door. 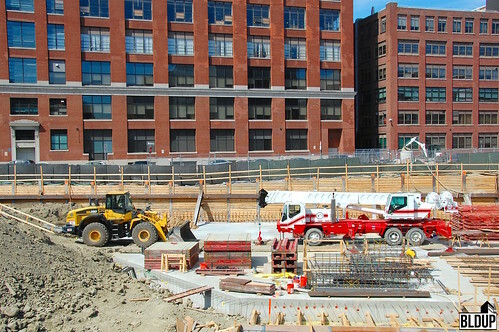 Interior work is wrapping up at 14 West, the new 49 unit luxury condo project in South Boston. A representative from Compass, the sales team on the project, has confirmed they expect the doors to open in about 30 days. The 10 story building will feature units ranging from 1 bedroom to four bedroom duplexes. 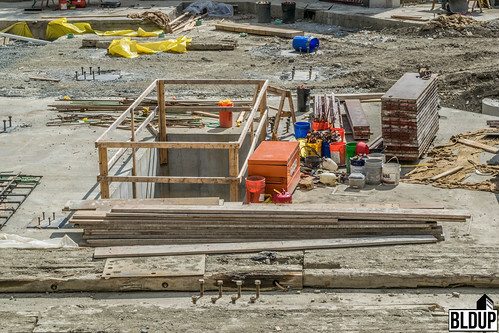 Resident amenities will include a roof deck, fitness center, and 24-hour underground valet parking. 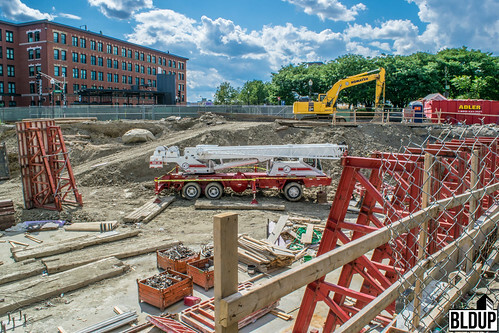 The Archer Residences is Beacon Hill’s largest luxury condominium development currently under construction. Developed by Center Court Partners, the building will feature 70 residences anticipated to be available for sale by the end of this month. Amenities at The Archer Residences will include on-site parking, concierge service, a fitness center, a kids room and a common roof deck. 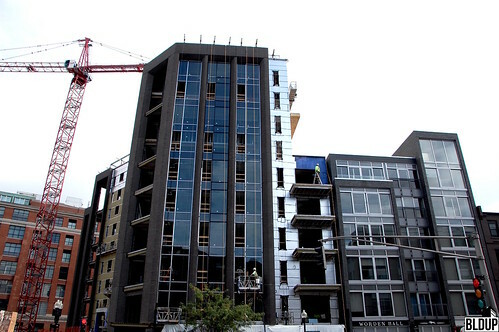 The 10-story facade of 14 WEST is nearing completion, with just about all floor-to-ceiling windows installed and nearly all precast brick panels in place. The facade is fully outfitted with weatherproofing and fireproofing. 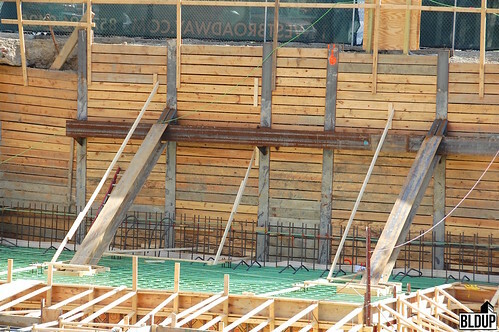 Inside 14 WEST, the building’s 49 luxurious, open-concept residences are just about fully framed, with large sections of vertical metal dunnage framing erected. In the coming months, luxurious finishes including engineered hardwood flooring, stainless steel appliances and marble bathrooms will be installed throughout the building. 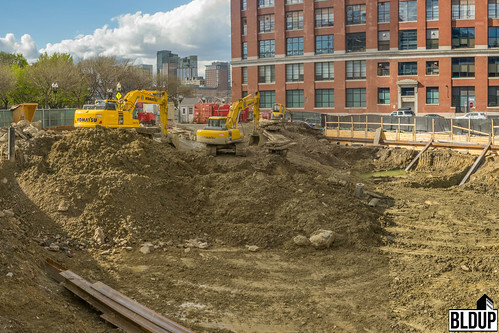 At 14 WEST’s summit, construction of the building’s private roof deck, which will feature panoramic views of Boston Harbor, the Blue Hills and the Boston skyline, has begun. 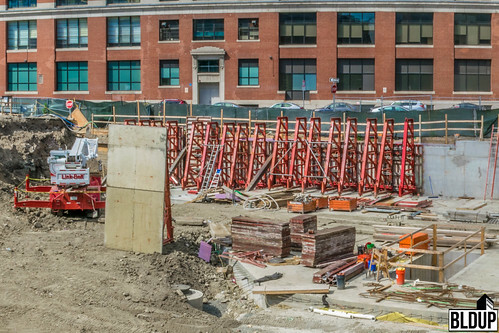 Set to open in April 2018, 14 WEST features 49 luxurious one-to-four-bedroom condominium residences appointed with premium finishes located in South Boston at the convergence of the South End, the Seaport District and Downtown Boston. Building residents will have access to top-line amenities, including a fully-equipped private fitness center, a covered portico offering 24-hour valet parking with direct access to the building's lobby and a private roof deck with sweeping views. 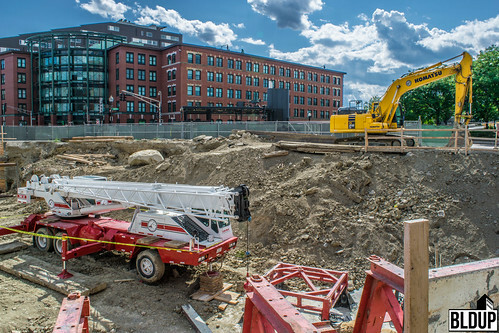 On 14 WEST’s ground floor will be a 350-seat, 6,000-square-foot restaurant, built by 14 WEST developer City Point Capital in partnership with one of Boston’s best restaurant teams. 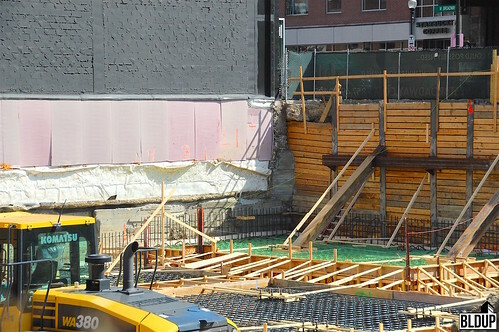 Next door to 14 WEST, vertical construction of City Point Capital’s Cambria Hotel at 6 West Broadway is underway. Opening in the first quarter of 2019, the 14-story, 159-key boutique Cambria Hotel will be built in partnership with Choice Hotels International and Meyer Jabara Hotels, and will feature a rooftop bar, a lobby lounge, a restaurant with local influence and a chef-driven concept, stylized décor, over 1,500 square feet of meeting space and a 2,400-square-foot fitness center also available to 14 WEST residents. 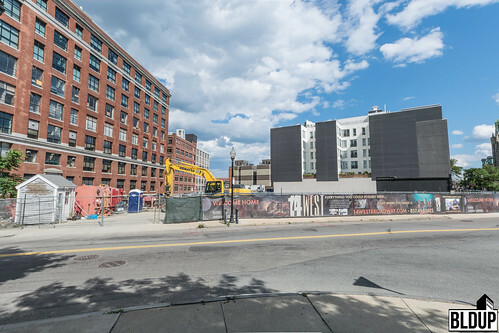 The first windows have been installed along the 10-story facade of 14 WEST, an exclusive new-construction luxury condominium building taking shape in South Boston at the junction of the South End, the Seaport District and Downtown Boston. 14 WEST’s floor-to-ceiling windows will overlook the Boston skyline and Boston Harbor, offering extensive views. 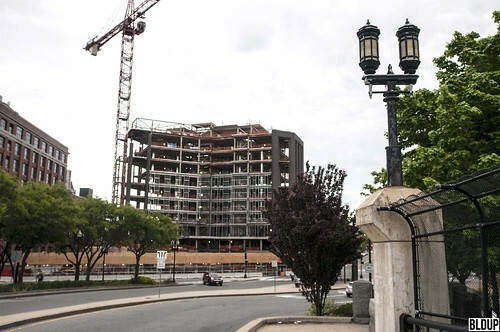 Weatherproofing of 14 WEST’s facade is complete, with moisture-resistant cladding fully in place, and silver exterior fireproofing has been installed along large facade sections. Unveiling in early 2018, 14 WEST features 49 luxurious, open-concept one-to-four-bedroom condominium residences appointed with premium finishes, including engineered hardwood flooring and marble bathrooms. Building residents will have access to top-of-the-line amenities, including a covered portico offering 24-hour valet parking with direct access to the building's lobby and a private roof deck with sweeping views. 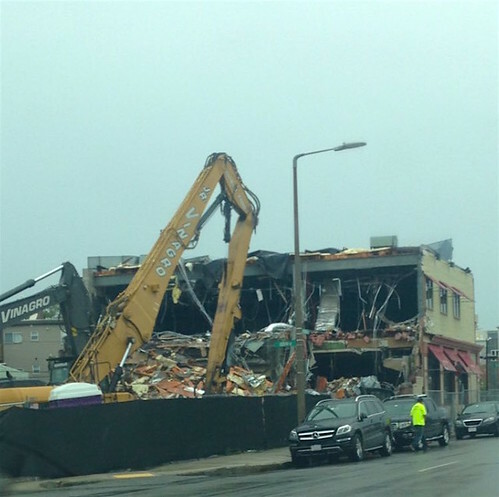 On 14 WEST’s ground floor, developer City Point Capital is partnering with one of Boston’s best restaurant teams to build a 350-seat, 6,000 square foot restaurant. 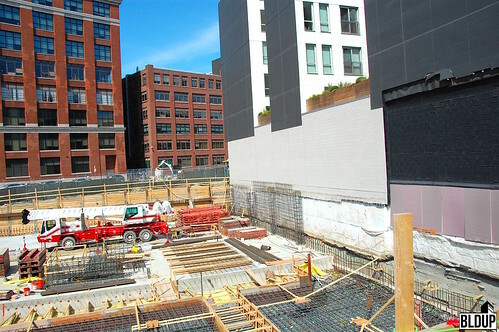 Interior framing of 14 WEST’s 49 luxurious condominium residences and exclusive common spaces is well underway, with vertical metal studs installed on nearly all floors. Precast brickwork installation is complete along 14 WEST’s façade. Weatherproofing sections of the façade, which will consist of metal panels and floor-to-ceiling windows, is also well underway. Moisture-resistant cladding is in place along large facade sections, and exterior fireproofing is in progress. 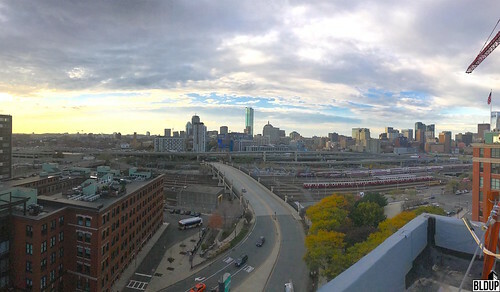 Installation of private outdoor balconies outside select 14 WEST residences is complete; 14 WEST will feature stunning Boston skyline and Boston Harbor views. 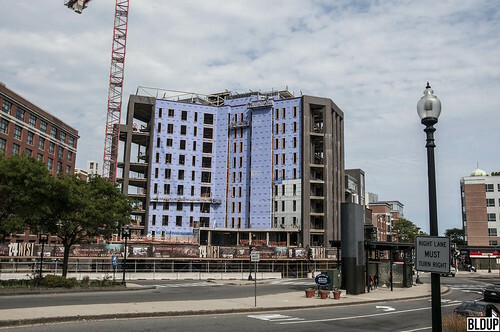 Installation of distinctive precast brickwork is nearing completion along of the facade of 14 WEST, a cutting-edge, new, full service 10-story building across from Broadway Station in South Boston. 14 WEST will feature 49 luxurious condominium residences which are now for sale. 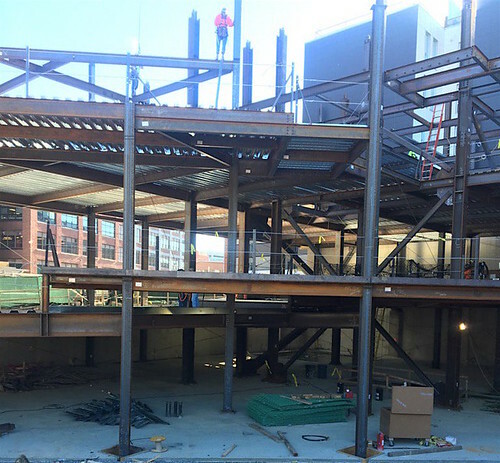 Along the sides of the building, steel infill walls have been installed in order to support and reinforce sections of 14 WEST’s facade that will consist of metal panels and floor-to-ceiling windows. The construction team is also installing private balconies along 14 WEST’s facade. 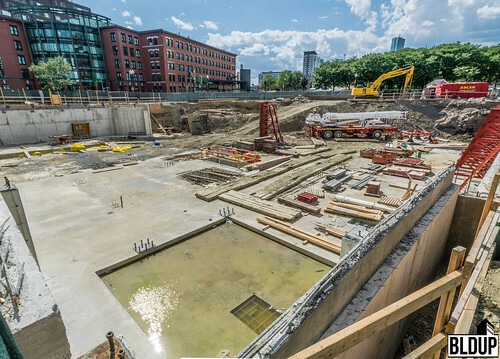 Residences at 14 WEST will be graced with stunning views of the Boston skyline and greater Boston. 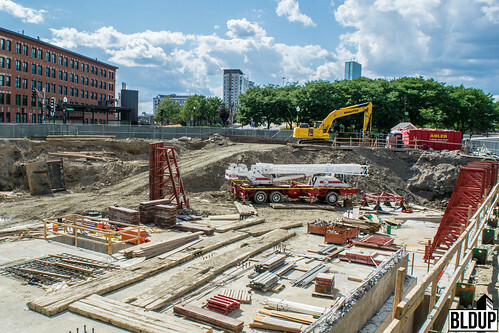 14 West’s concrete foundation is complete, and construction of the building’s 10-story steel superstructure has commenced. 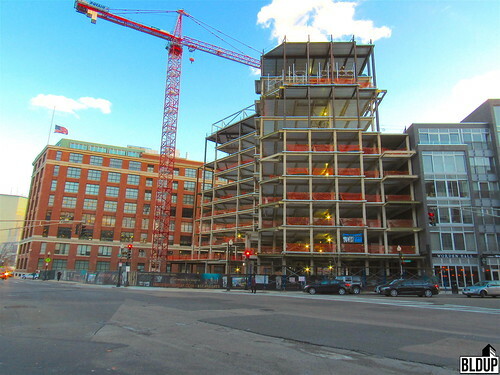 Per a photograph tweeted by developer City Point Capital, the superstructure has risen two levels above grade. The 14 West construction team is at work welding steel beams together to construct the building’s structural steel frame. More information about 14 West can be found below. 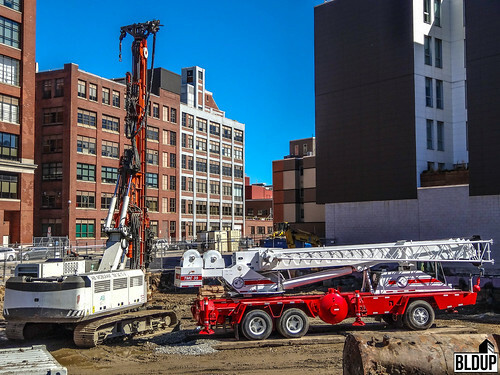 The Boston Redevelopment Authority approved Archer | Donahue on Beacon Hill for construction at last Thursday’s board meeting. 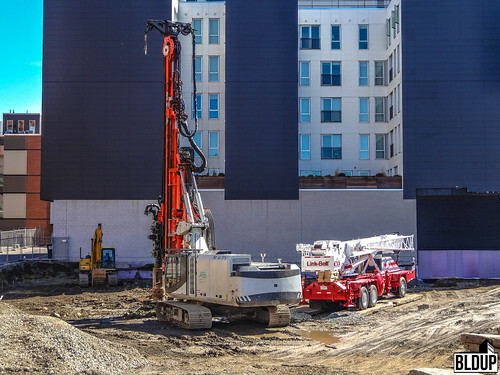 Developed by JDMD Owner, LLC of Dedham, the $162 million Archer | Donahue will feature 71 residential condominiums with approximately 5,700 square feet of undetermined resident amenities. The project will fully restore two existing buildings at 33-61 Temple Street and construct a new penthouse level. Construction of Archer | Donahue could commence this summer. A rendering of Archer | Donahue is posted above. 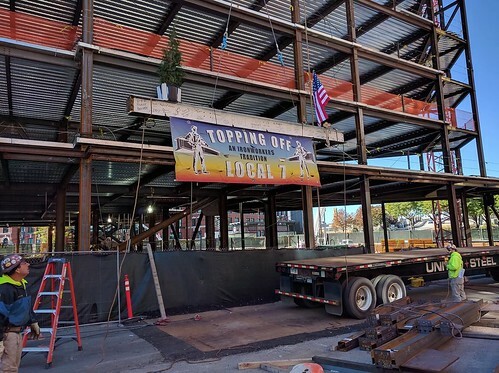 Since the project's Expanded Project Notification Form (EPNF) filing, Archer | Donahue's penthouse level height has been reduced and will not exceed the height of the existing structure. Residential unit count has decreased by four; 75 units were originally proposed. Parking space count has been reduced to 54 from 60. More information about Archer | Donahue is posted below. 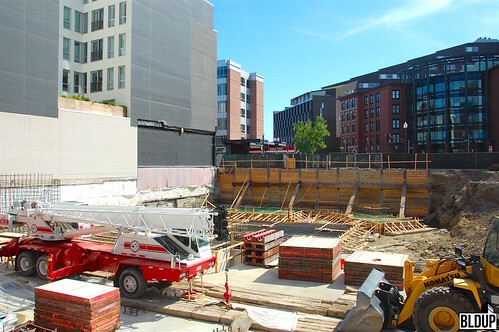 Excavation of 14 West’s underground parking structure is complete. 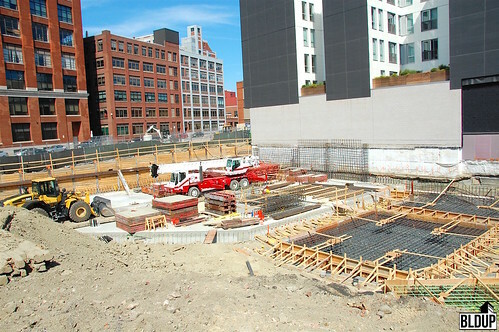 Concrete pouring is underway along the base and sides of the parking structure to construct the 10-story building’s foundation. 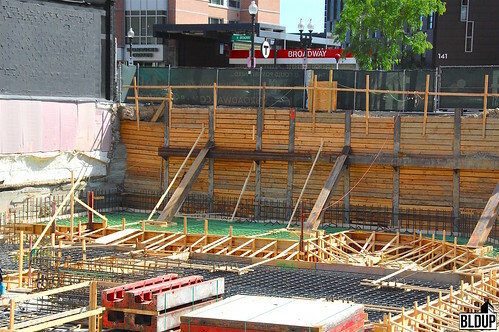 A slab of concrete has already been poured along the base of the parking structure. 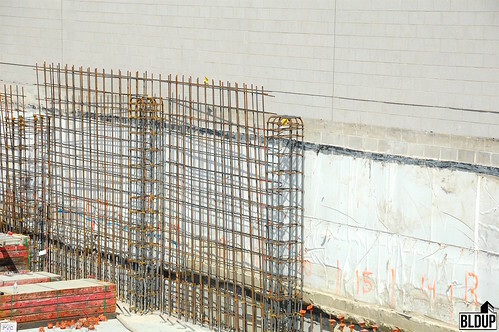 Steel and wood forms are set along the base and sides; concrete will be poured into the forms to construct the foundation. 14 West will feature 49 residential condominiums and a 350-seat restaurant. 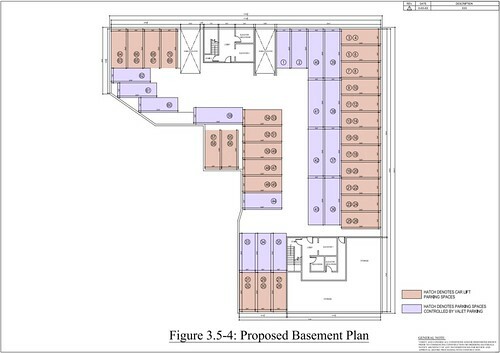 Pre-sales marketing of condominiums at 14 West has begun, visit 14WestBroadway.com for more information. Delivery of 14 West is expected in the fourth quarter of 2017. 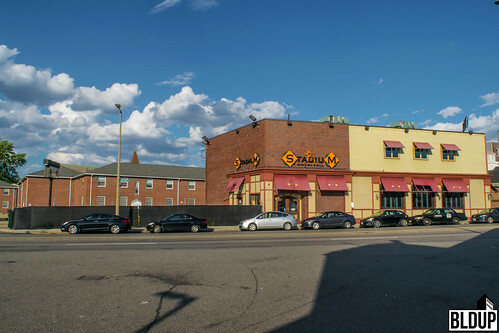 14 West is located at 14 West Broadway in South Boston. 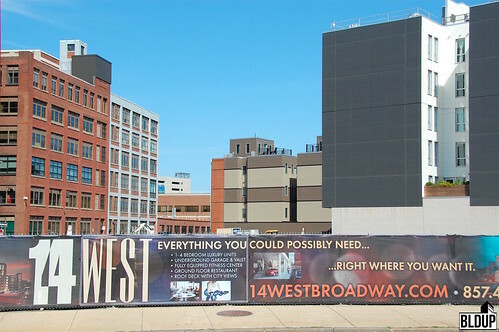 More information about 14 West, including additional renderings, is posted below. 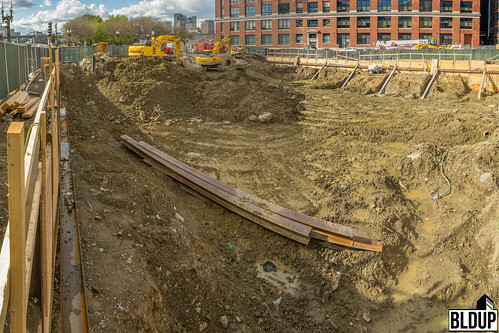 Excavation of 14 West’s underground parking structure is underway. Massive quantities of earth have been removed from the project site to construct 70 new parking spaces. 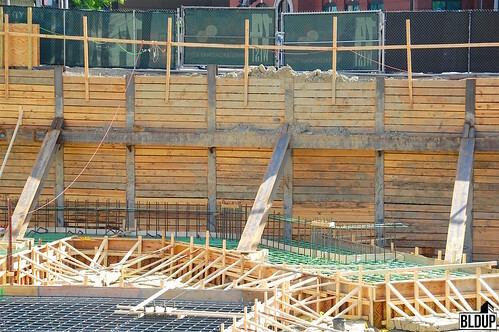 Wooden shoring walls are installed along the sides of the project site to ensure stability of the foundation perimeter and minimize impact upon surrounding buildings and utilities during excavation. 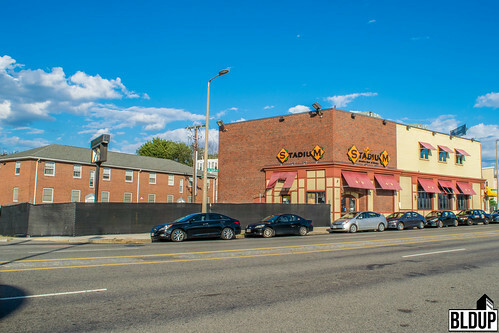 JDMD Owner, LLC has submitted an Expanded Project Notification Form (EPNF) for the proposed Archer | Donahue project on Beacon Hill. The development team hopes to start construction in late summer 2016; Consigli Construction is the project's construction manager. 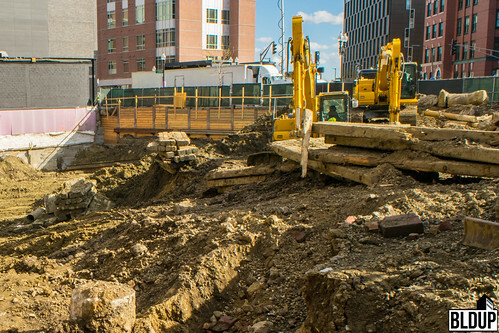 Excavation is moving forward at 14 West. An ABI Mobilram is parked on site, presumably to commence driving of piles and construction of 14 West's foundation. 14 West, developed by City Point Capital, recently secured financing. The project has a new architect, RODE Architects. RODE Architects is also designing City Point Capital's neighboring 6 West Broadway. 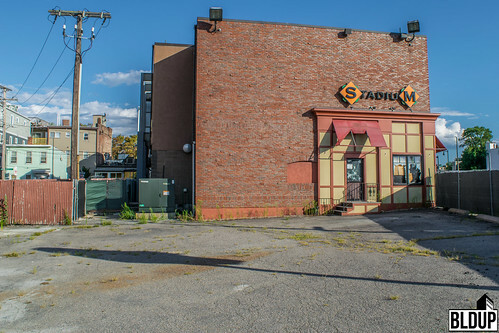 City Point Capital acquired the 6 West Broadway site on November 30th, 2015. 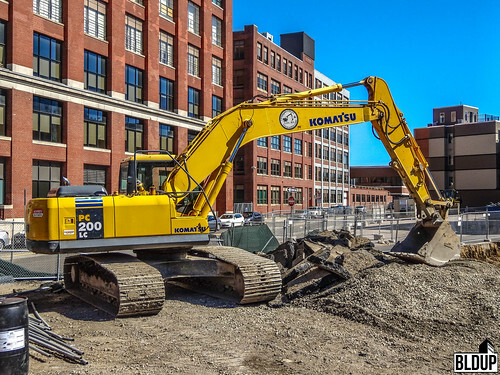 JDMD Owner, LLC has submitted a Letter of Intent to the Boston Redevelopment Authority to construct 75 condominiums in two former Suffolk University buildings on Beacon Hill at 33-61 Temple Street. The following is a link to the full Letter of Intent. More information about the proposed project is posted below.